All Signs Point to Otter Creek Used Books! Signage is up on the kiosks here in the Marble Works. The store’s new home! Yea! Now people should find me. Fingers crossed! And listing is alphabetically: second column, 9th down. See it? Yea, I’m pretty excited to see it. Great to see one’s name up in lights. Only…ok…no lights and it’s not my name. It’s the next best thing! My store is listed. Ok, so guess it doesn’t matter. Just had a couple in here who couldn’t find the store and had to ask for directions. mmmm. Even when I was on Main Street people couldn’t find the store. Yes, I’m serious. Ugh! 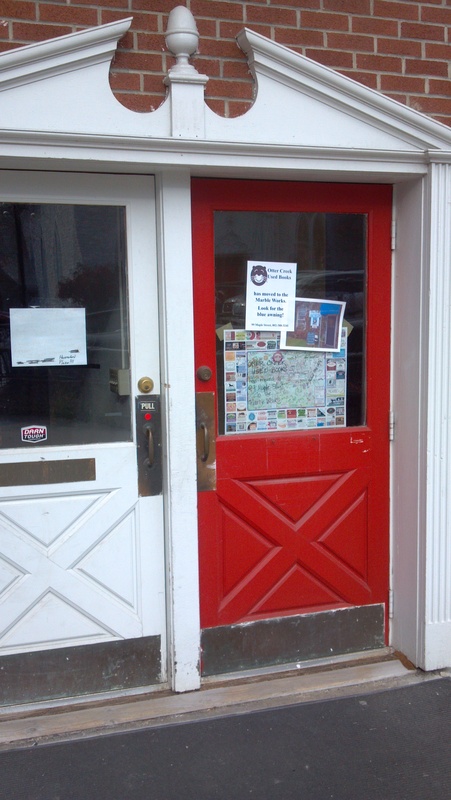 Main Street Door - note map, announcement AND photo of new front door! On the old store’s front door I posted a sign to let/remind people that I moved. 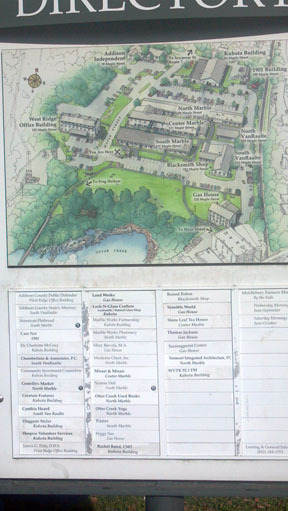 Added a map with directions – dots to follow to lead customers to the new front door. And included a visual – a photo of the new front door so people would be able to find the store better. And to look for the blue awning. The only blue awning down here. So… still people are having problems finding me. What else can I do? I did have an idea to paint otter paws leading from Main Street to the new store. I seriously contemplated it. It would have been too obvious who had done the dirty deed. Agree? But it would have been fun to do in the dead of night. No moon. People waking up to see otter paw prints in town. The mystery of it all. Oh! My! What size otter could make those paws? Ah, but then some smartie would say how interesting that they lead from one store to the other. Yea, too obvious.